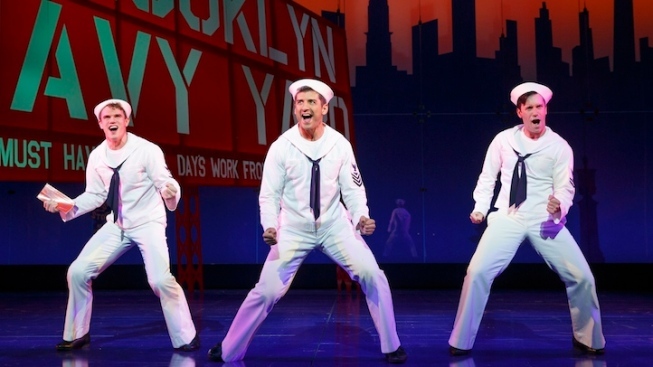 Jay Armstrong Johnson, Tony Yazbeck and Clyde Alves in the Broadway revival of "On the Town." The critically acclaimed revival of Leonard Bernstein, Betty Comden and Adolph Green’s “On the Town" will end its run at the Lyric Theater on Sept. 6. At the time of its closing, “On the Town” will have played 28 previews and 368 regular performances. "On the Town" stars Tony nominee Tony Yazbeck, Jay Armstrong Johnson and Clyde Alves as three sailors on 24-hour leave in New York City. The musical features several classic numbers, including "Lucky to Be Me," "Lonely Town," "I Can Cook Too" and the energetic opener, "New York, New York"
Misty Copeland, principal dancer at the American Ballet Theater, will join the cast for two weeks -- and only 12 performances -- beginning on Aug. 25. Directed by John Rando and choreographed by Joshua Bergasse, “On the Town” was nominated for four 2015 Tony Awards, including best revival.